Some people prefer the accuracy of a Bluetooth (BLE) heart rate monitor (Polar H7, Wahoo TICKR or Scosche Rhythm+) to the built-in Apple Watch pulse sensor. MotiFIT supports the use of an external Bluetooth heart rate / pulse monitor with Apple Watch. 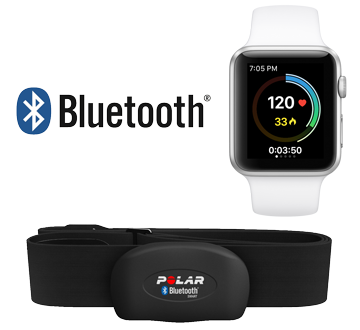 Most of the time when users have issues pairing their Bluetooth heart rate / pulse monitor it's because it is connecting to another device (Apple Watch, iPad, iPhone, etc). The reason for this is that a heart rate / pulse monitor can only be connected to one host at a time. For example, if your phone connects to your heart rate monitor before you watch, the watch will not be able to connect. A helpful trick is to turn OFF the Bluetooth of the phone or other devices, in case that they are stealing the heart rate monitor's connection. Once you have the heart rate monitor connected to the Watch, you can re-enable the bluetooth of the other devices.